Rating: 3.5/5 – Baron Weirwulf’s Haunted Castle! Charlton’s Haunted began in 1971 as a horror and suspense anthology similar to House of Mystery or House of Secrets. In the first twenty issues, the stories were hosted by a small ghost-like creature named Impy. 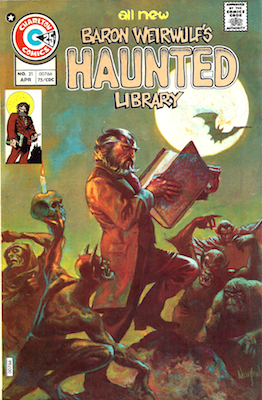 Then with issue number twenty-one, new host Baron Weirwulf took over and the title changed to Baron Weirwulf’s Haunted Library, but only on the on the cover. The title actually remained the same in the indicia. You can see the Baron on the cover, exquisitely painted by artist Don Newton. Weirwulf explains to the reader on the opening page that he’s the new proprietor of the haunted castle and that the books on the shelves of the library within are some of the most unusual tales ever told! The first story is a true gem and the best of the book. Tom Sutton writes and draws the tale that’s heavily inspired by the works of H.P. Lovecraft called “Out of the Deep”. After a man named Mr. Hardy washes up on the shore of a small island with a bell tower as one of just two buildings, an old man within who quickly learns (or knows) that Hardy has killed his crew mates. Within the bell tower are engravings of fish monsters and Cthulu-like creatures. As the bell begins to ring Hardy believes that it tolls for him, but instead it rings for something much worse. Seeing Sutton’s art is a great treat and although it’s not as strong as some of his Warren work, it’s still fantastic. The second story of the issue is called “Enter Freely and of Your Own Will” and is scripted by Frank Hayes with art by Pat Boyette. It’s essentially a Dracula story although the villain isn’t Dracula. It does have the twist ending, but the twist wasn’t all that shocking. The art by Boyette is a bit plain and the Dracula character isn’t all that scary, but Boyette tells a clear story in its eight pages. It should also be noted that Weirwulf doesn’t narrate the opening of this story, or the endings of any of the stories which is more common with the Warrens Magazines, EC or DC Comic hosts. The final story has Joe Staton on the pencils and although the art looked great, the story wasn’t all that memorable. In “Pool Shark” a modern day sea bum/pirate kills a tribal witchdoctor by feeding him to the sharks, which makes him afraid to ever enter the ocean again. Of course he isn’t as careful as he had planned and tragedy strikes. Staton’s art can give Sutton’s opening story competition for the best looking of the two, and if the story were more enjoyable it could have, but the ending seemed a bit too far fetched and closed the book on a low note. That being said, this is still a solid issue with some great talents providing some beautiful art and the first story alone is worth seeking this issue out. In the letters page at the end, the editor explains that “some publishers try to force their illustrators to conform to a certain style and standard. In our opinion this is a mistake. An artist should have a free hand…..creativity is encouraged. We want our writers and artists to feel uninhibited when they work on a Charlton assignment.” Seeing the art here is reflective of this thinking and now it’s time for me to search more of these issues out to see this creativity first hand! This entry was posted in Charlton and tagged back issues, Baron Weirwulf Haunted Castle, Charlton, comics, Don Newton, Haunted, Joe Staton, Tom Sutton, vintage comics. Bookmark the permalink.